The classic octagonal shape of this platter lends itself to almost any décor. Perfect for serving seafood salad, a small roast beef, salmon filet, or warm stack of French toast. This Italian seafood salad is filled with the flavors of the sea. It is wonderful dinner entrée on a warm summer evening. 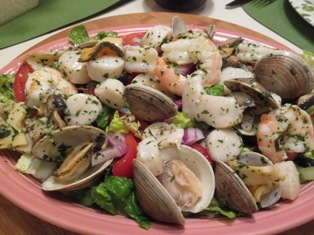 Seafood salad can also be served as part of a tradtional Christmas Eve dinner. 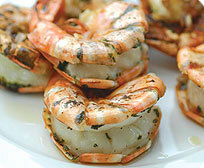 The chilled seafood is combined with a lemon juice and olive oil dressing and served over a crispy mixed green salad. 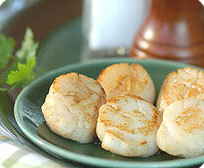 Serve the seafood salad with a crusty Italian baguette or ciabatta bread. Place the clams in a saucepan with about an inch of water. Cover and bring to a simmer. Cook until all the clams are opened, about 5 minutes. Remove the clams with a slotted spoon or skimmer. Transfer the clams to a large glass/ceramic bowl. Discard any clams that remain closed. Add 1 cup of water and a pinch of salt to the saucepan. Bring the liquid back to a simmer. Add the squid rings and cook 1-2 minutes. Transfer the squid rings to the bowl with the clams. Bring the liquid back to a simmer. Add the shrimp and scallops. Simmer gently for 2-3 minutes. Transfer the shrimp and scallops to the bowl with the other seafood. Whisk together all the dressing ingredients in a small bowl. Pour the dressing over the cooked seafood. Gently toss the seafood to coat with the dressing. Arrange all of the salad ingredients on a large platter. Pour the seafood and dressing over the top. Gently toss the seafood with the salad. Serve immediately. Optional: Sprinkle individual servings with Parmesan cheese.